Northern Lights CrossBoxes are configurable and infinitely expandable with the ability to put pullup bars at different heights, customizable widths with 43" & 70" X-Bar components, customizable depths with 24", 43" & 70" XBar components, customizable heights with 90", 108", or 144" uprights, and choose from a group of accessories to make your CrossBox uses endless. A common configuration would be to setup your Custom CrossBox in the center of the gym with alternating 4 foot and 6 foot upright spacing for alternating squat racks and pullup bars as far as your space will permit. 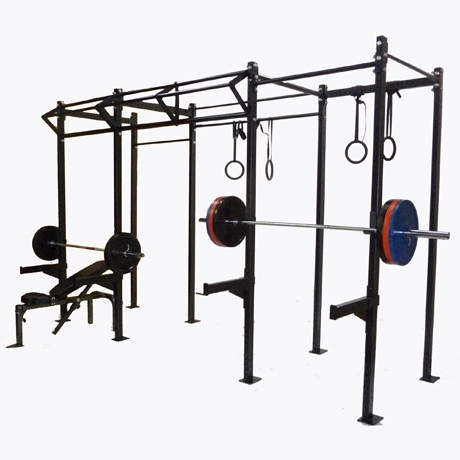 Additional accessories like, Safety Spotter Arms and Multiple Pullup Bars, can be added so that everything you need for a workout is provided. 2 inches everywhere else from the floor to the pull-up bars. Customizable 4' or 6' Width. Customizable heights with 90", 108", or 144" uprights with 7" x 5" x 3/8" floor plates. hole spacing above and below from the ground to the pullup bars. Pullup Bar height is adjustable, Single bars can be substituted to accommodate taller athletes or add additional height for rings. 144" (12') upright configuration is ideal for using climbing ropes. Unit Must Be Bolted to the Floor.